It is easy to combine Vietnam and Cambodia from Ho Chi Minh city. Start the tour from busy commercial city Ho Chi Minh with some excursion to Cu Chi tunnels, Mekong delta and then catch a short flight to Siem Reap the enigmatic Bayon Temple, the jungle-covered Ta Prohm Temple, the magnificent Angkor Wat, and enjoy a Khmer dinner accompanied by traditional dance. Welcome to Saigon - today’s Ho Chi Minh city - the country’s commercial centre. The city never sleeps with over nine million inhabitants and five million motorbikes. The drive and tour guide will pick you up and then transfer to city centre. You have free time after flight and then enjoy welcome dinner at the local restaurant. Back to Saigon for half day city tour, including The Reunification Palace, Notre Dame Cathedral and Old Post Office, Remnant War Museum and Ben Thanh market. Today you will catch flight to Siem Reap - the home to the Temples of Angkor, claimed as the most remarkable and impressive sights in all of Asia. Pick up from the airport and transfer the city centre. After a short break, drive to Choueng Kneas village, where you will take the boat to visit the way of life Cambodian poor people along with schools, restaurants, hospitals and much more floating on the great lake of Tonle Sap. Enjoy dinner with Apsara dancing show at the local restaurant. Today, you will drive on a new paved road to visit the intricately carved and well preserved temple of Banteay Srei. Along the way you make stopover at the Preah Dark village and the Banteay Samre Temple adorned with impressive relief’s depicting scenes of Vishunu as well as Krishna legends. Afternoon, you explore the jungle covered temple of Ta Prohm is an incredible sight. There are enormous fig trees and gigantic creepers which embrace themselves in the stone foundations of the structure giving the impression of man's creation being reclaimed by the powerful forces of nature. You also explore the grand circuit with Preah Khan, Kravan, Neak Pean, Krol Ko, Ta Som, East Mebon and Pre Rup Temples where you will view the sunset for the end of the day. An early bird special: Transfer to Angkor for sunrise earlier in the morning. Return for breakfast at the hotel then continue your visit to the wondrous ancient ruins with the South Gate of Angkor Thom. It is famous for its series of colossal human faces carved in stone, the impressive Bayon Temple, the Royal Enclosure, Phimeanakas, the Elephant Terrace, the Terrace of the Leper King and the largest as well as the most complete temple of Angkor Wat. This architectural masterpiece was constructed in the 12th century and covers an area of about 210 hectares. You stroll around this massive edifice, seeing the many galleries with columns, libraries, pavilions, courtyards and ponds full of water reflecting the towering temple. Early evening, you will be taken by Tuk Tuk around the suburb of Siem Reap town and enjoy a blessing ceremony by Buddhist monks for happiness, prosperity and safety. You have free time until be transferred to the airport for your departure flight. End of the tour. Thank you for using our service. 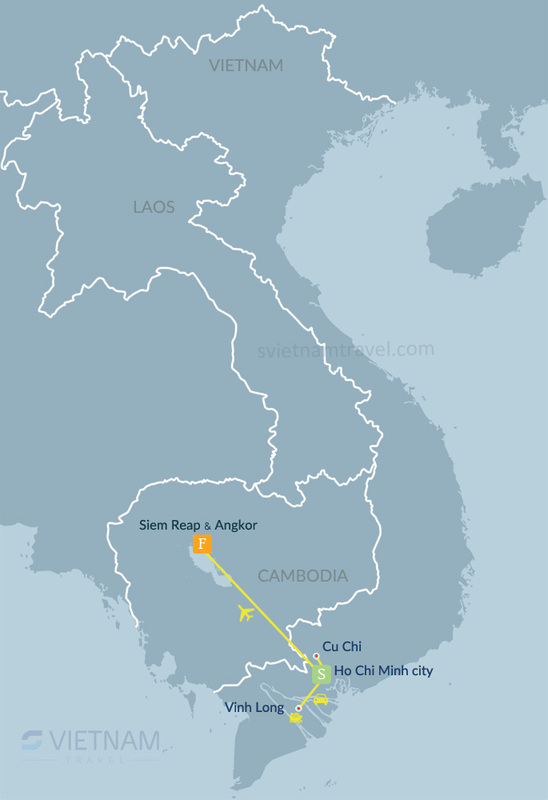 Flight ticket Ho Chi Minh city - Siem Reap.